Is Kazakh President Nursultan Nazarbayev developing a soft spot for democracy in his old age? Don’t hold your breath, says Joshua Kucera. In December, a Kazakhstan citizen proposed a referendum to allow the country’s president, Nursultan Nazarbayev, to remain in power without elections until 2020. Within days the petition had secured more than 5 million signatures—close to a third of the country’s population—prompting sceptics to dismiss it as a classic case of a faked grassroots movement, engineered by the government (a charge it has denied). And when Nazarbayev publicly rejected the idea, and instead proposed holding early presidential elections, it just seemed like more political theatre. Unsurprisingly, the parliament—which consists only of members of Nazarbayev’s party—approved the measure to move up elections, which will now be held in April 2012. That Nazarbayev will win the elections is a foregone conclusion. For one, he’s genuinely popular in Kazakhstan: a US-conducted poll in 2010 showed that 91 percent of Kazakhstan’s citizens approve of his rule. Under his 20 years in power, Kazakhstan has gotten rich on oil and natural gas money and developed a genuine middle class, while avoiding the instability that has plagued many of its Central Asian neighbours. Still, just to make sure, Nazarbayev has systematically sidelined any potential opposition so that even if Kazakhs wanted someone to replace him, there isn’t anyone to vote for. Meanwhile, he has restricted independent media, meaning that even if there were anyone able to stand, there would be no way of voters knowing they existed. So what was the point of the whole referendum/snap elections drama? Nazarbayev often seems torn between his need for love from his people, and for respect from the West. But those two needs can sometimes pull him in opposite directions. The former has resulted in a burgeoning personality cult in which he is identified closely with the state. 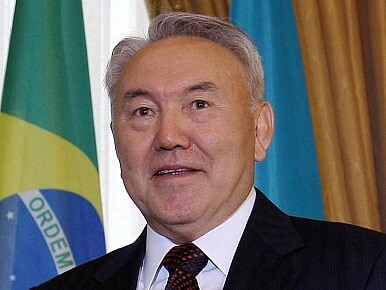 The national holiday celebrating the capital city, Astana, is also Nazarbayev’s birthday. Indeed, Nazarbayev has taken an active, personal role in the construction of Astana, and at the top of its central monument, the Baiterek (‘Independence’) Tower, is a bronze handprint of the president’s in which Kazakhs are meant to put their own hands and make a wish.